A helicopter department was set up in 1945 as part of the aircraft division at Filton, and Austrian-born Raoul Hafner, who had devoted himself to rotary wing research in the thirties, moved to England before the Second World War and took charge in 1944. Design studies, under Raoul Hafner, were started in June 1944 and, since no suitable British engine was available at that time, the two Mk.1 prototypes (VL958 and VL963) were built with 450hp Pratt & Whitney 11-985 Wasp Junior radial engines. These were 2-seaters, conforming to Ministry of Supply specification E.20/45. The design featured a light alloy cabin section and a stressed-skin tailboom attached to a central engine and gearbox mounting, the rotor head being fitted with three wooden monocoque blades. The crankshaft lay horizontally, with power transmitted to the vertical driveshaft through a gearbox. The three rotor blades were made of wood with leading edges in hardwood. After component testing, ground running of the completed airframe began on 9 May 1947, the first flight (VL958) was made by H. A. Marsh on 27 July 1947. The second aircraft (VL963) joined the test programme in February 1948 and on 25 April 1949, to facilitate its flight to the Paris Salon, it became the first British helicopter to be granted a civil certificate of airworthiness. The third airframe appeared in the static park at the 1948 SBAC exhibition at Famborough. This was followed by the first flight on 3 September 1949 of the one and only Mk.2, built as a 4-seater to specification E.34/46 and powered by a 550hp Alvis Leonides 71 LE 21 HM piston engine in a horizontal position with the crankshaft running vertically. This eliminated the lower gearbox which not only saved weight but made the engine more accessible for checking and repairs, and increased the seating from two to five. It was of metal construction with a three-blade main rotor and was designed as an air taxi (four-five seats) and for military tasks such as air observation and casualty evacuation. This aircraft formed the basis for the first production series, although numerous detail modifications were made to individual machines in these batches, some becoming standard on later production aircraft. Seating was increased to six. A second take-off attempt ended abruptly when the rotor disintegrated. 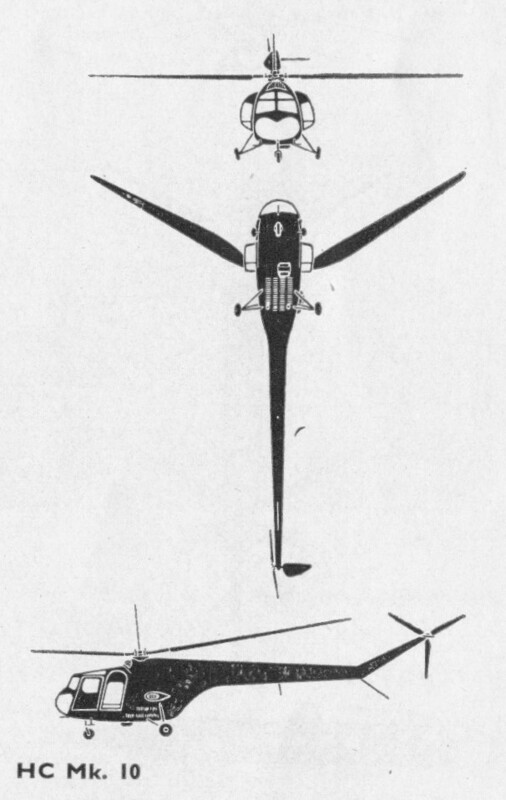 With a strengthened rotor, development flying was resumed while work continued on the assembly of 15 production Mk 3s with a smaller Alvis Leonides 73 engine. Airframe changes included a shortened nose and an 0.20m increase in cabin width to accommodate three passengers on the rear seat; in order to maintain essential systems in the event of engine failure, and the accessory drive was transferred from the engine to rotor gearbox. The Sycamore had a simple auto-throttle which the pilot could override. The Type 171 was manufactured at Filton and Weston-super-Mare. Two Mk 3A were bought by British European Airways. They had a slightly superior performance to the Mk3 and greater baggage capacity, with a freight hold behind the engine bay. BEA began an experimental service with these helicopters between Eastleigh and Heathrow airport in 1954, which lasted for about two years. The first two production batches, totalling twenty-five aircraft, included one HC Mk.10 ambulance for evaluation by the Army Air Corps; four HC Mk.11's for Army communications work; four HR Mk.12's for RAF search and rescue duties, evaluated by Coastal Command; and two winch-equipped HR Mk.13's for similar trials with Fighter Command. These were collectively to Mk.3 production standard, with 520hp Leonides 73 engines. Two Mk.3A's with improved performance, a shorter nose and extra baggage space behind the engine bay, were completed for British European Airways. Of the remaining dozen machines, five were to Mk.4 standard, also with Leonides 173 engines and having four cabin doors; these were built for the Royal Australian Navy (three HR Mk.50), Royal Australian Air Force (one) and RAF (one HR Mk.14). All of these were completed to Mk.3 standard with a Leonides 173 engine. The remaining seven aircraft were a mixture of Mk.3 and Mk.4 reserved for military trials or civil demonstration. The 1950 Mk.4 with four access doors, a longer-stroke landing gear, a bigger baggage compartment and an hydraulic winch and the pilot's position moved from port to starboard. This was primarily intended for search and rescue and air ambulance duties, and was supplied to the RAF (two HR.13s and 80+ HR.14), Belgian Air Force (three Mk.14B), Royal Australian Navy (three HR.50 & seven HC.51, equipped with winches for air-sea rescue duties, initially with No. 275 Squadron) and West German Government (50 Mk.52). No. 275 Squadron, RAF. received its first helicopter on 13 April 1953. Sycamores also operated in the light assault and reconnaissance roles in Malaya, Cyprus and Borneo, joining No.194 Squadron in Malaya in 1954 and No.284 in Cyprus late in 1956. In August 1955 a 171 took part in the first British air-to-ground television transmission involving the use of a helicopter. The Bristol Type 171 Sycamore Mk.4 was the final production version of this machine. 178 examples of which had been completed when the last was delivered in 1959. Of these 50 were built in 1957-1959 for the Federal Germany as the Sycamore Mk.52, most serving with the Luftwaffe but 4 being delivered to the Navy, joined later by a further four from the Luftwaffe stocks. The German Sycamore Mk.52 helicopters were withdrawn from service in 1972-1973. 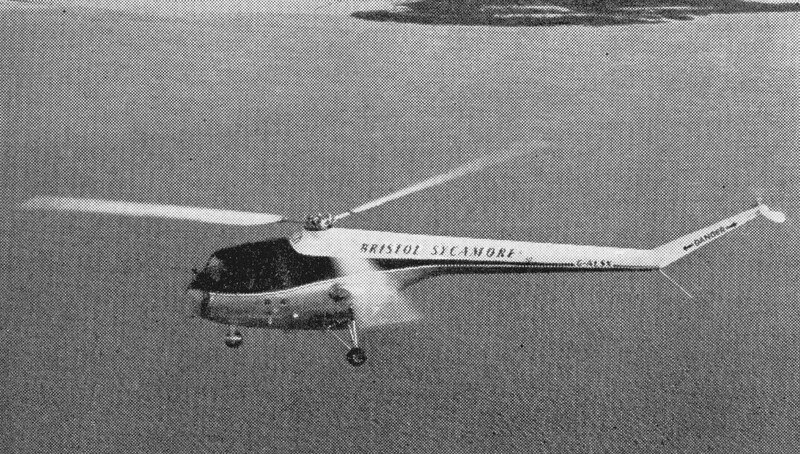 In the mid 1950s Bristol Aircraft Ltd began work on a turbine-powered helicopter using a Mk 3 with an increased fin area. Under the name Bristol 203 it was to be an 11-seat machine and parts from the incomplete 179th and 180th Sycamore airframes were used in the prototype machine. This project was abandoned when the company was taken over by Westland, although some of its finer points were later incorporated in the Lynx. Fuselage length: 46 ft. 2in. Typical range: 268 miles at 92 m.p.h. Rotors: 3-blade main; 3-blade tail. Rotor diameter: 48 ft. 6.75 in. Back in 1968, I was hired by Associated Helicopters in Bankstown, NSW to ferry their one flyable, of 5-hulls & a hanger-full of spare parts they had bought surplus at the time, up to Port Keats Mission (about 200nm S.W. of Darwin) and work a mineral exploration contract. The ole Sycamore was a more-than-interesting bird - to say the least! With that short-arm collective (+/- 15-inches fulcrum to end) / rt. angle throttle and direct NO hydrolic-assist linkage to the swash-plate: it was like physically lifting the bird WITH ONE ARM!!! ... Add to that; a fully-castering nose gear and a 40-gal. liquid ballast system that had to be transferred during lift-off, so extra collective friction was necessary to hold it while reaching for the transfer-pump handle - otherwise; you were instantly back on the ground with a much bigger, LIFE-FULL OF GROUND RESONANCE problem to handle!!! ... Albeit; once you had her in the air, all you had to be concerned with was the sporadic - no plausible answer why - 0.5 - 1.5 second engine STOPS that gave your heart its EXTRA exercise for the day. Having acquired some 85-hours flt.time in the course of that experience; upon return to Sydney I was fortunate to be in conversation with some old RAN Sycamore drivers who expressed no small amount of chagrin that I had been so successful, as to still be alive to enjoy that moment with them. I allowed as how My Holy Spirit keeper obviously had other things for Me to do, before He punches My "ticket". ... All of that was at +/- 2,200, of the final 13,420 flt.hrs. He has blessed Me with. ... God Speed!! !